Well we had our second of 4 shows today. I woke up this morning with a massive backache (and it is still here), I can tell you I feel bad for anyone out there that experiences this on a regular basis. But anyway the truck got loaded and we drove down the street and I started to get things set up. Got everything in place. It was a rather slow start to the day but traffic picked up and we came out well. 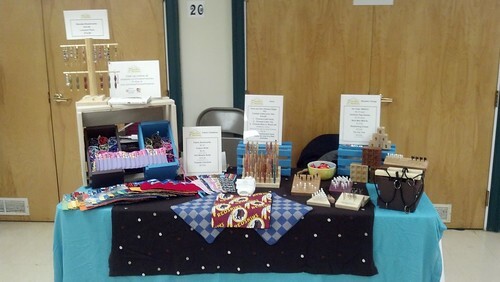 Big seller today was more of my wife’s crayon rolls and also my pens made a great showing with 6 or 7 selling. We now have a couple of weeks before the next 2 shows, hoping to get into the shop and turn a few more pens and maybe add a new game to the line up. Plus we are going to spend some time this week and get some items up on our new Etsy store. Thanks all for looking and I hope everyone has a good rest of the weekend. Gotta ask, what are Crayon Rolls? How did the games do? Crayon rolls are a fabric strip with pockets for individual crayons they then roll up and tie closed so you can carry them around in a tote bag/purse/whatever. My wife makes them as well as ones that hold hot wheels cars. They are both generally good sellers. The games did well, had one person buy 3 different ones. Will be replenishing my inventory as well as making a few new ones for the next two shows, as soon as I can stand in my shop for a long enough period of time. HERMOSO STAND DE ARTESANÍAS CHRIS!!!!! !